Royal Bank of Scotland (RBS) chief Ross McEwan has conceded the 80 percent state-owned bank will pay staff lucrative bonuses from a pool of £421 million, despite the fact it faced losses of £3.5 billion in 2014. McEwan took control of the scandal-ridden bank in 2012 after it became insolvent and received a £45 billion bailout at UK taxpayers’ expense. The RBS chief told BBC Radio 4 he would not be taking a £1 million bonus this year. 2015 marks the second year he has declined to accept the annual financial reward. Nevertheless, he maintained he could do nothing to change the situation. He said it is necessary for competitive banks to pay staff financial awards if they carry out technical work. Following a global financial crisis that threatened to derail the British economy, RBS was part-nationalized in 2008. It is currently 80 percent owned by the British state. Since 2008, its losses total a mammoth £50 billion. Speaking to the BBC, McEwan said the bank has become more robust in recent years, but still has a long road ahead. He stressed he will not take a bonus in 2015 because he wishes to focus on bringing RBS back to pre-crisis levels of profitability. 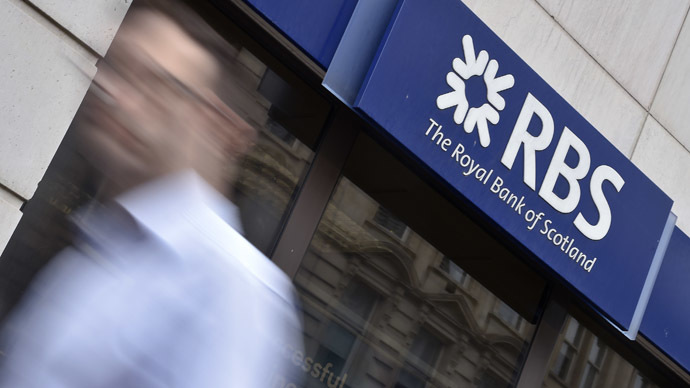 Four top RBS officials, who presided over its demise, are embroiled in a £4 billion lawsuit spearheaded by shareholders. The High Court case against the bank was launched in 2013 by irked investors, who had suffered losses when the bank collapsed. They accuse RBS of deceiving shareholders, after the bank’s finances were artificially inflated by £12 billion mere months before it became insolvent. It later required an astronomical bailout at the expense of an already stretched public purse. In 2014, McEwan said the bank “will defend itself vigorously” against the lawsuit. Court proceedings are due to resume in 2016. RBS’ decision to pay its staff large bonuses coincides with a damning report, which predicts poverty in the UK will soar by 3.6 million over the next 15 years unless drastic measures are taken by governments. The report, published Wednesday by the Labour Party-linked Fabian Society, claims inequality in the UK will continue to soar unless the next government takes action. Current research indicates that a small proportion of investment bankers earn more in 12 months that the vast majority of Britons do in a lifetime. In 2014 alone, Britain’s finance industry paid staff £15 billion in bonuses. Following the start of this year’s bonus season, activists from the Robin Hood Tax campaign analyzed data from the Office of National Statistics (ONS). Their research indicates that bonuses paid out in Britain’s finance industry have hit £91 billion since 2007, and will most likely rise to £100 billion by the close of March. He said “an unreformed financial sector” continues to pocket lucrative profits, while the vast majority of ordinary taxpayers are left to clean up the mess.